The restaurant tower at Marina Walk. NIC, the breakwater developer and owner of Marina Mall Abu Dhabi, will start work on the 300,000-sq-m expansion in the second half of 2018, while a series of upgrades to the mall’s current facilities will begin in early 2018, say senior company officials. In addition to the extension, NIC has revealed plans for a new promenade, Marina Walk, offering 546 m of prime waterfront views and 123,000 sq m of leisure and entertainment experiences aimed at all ages in the community, including Abu Dhabi’s first skate park. 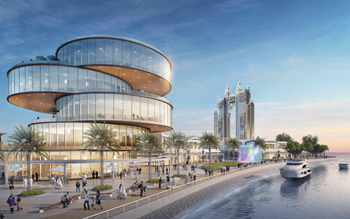 Marina Walk’s 19,500 sq m of gross leasable area (GLA) will also be home to a fabulous new dining precinct, boasting a brand-new restaurant tower that offers the Abu Dhabi community, and the area’s vast tourist population, an even greater overall experience at its unique location overlooking the Arabian Gulf, say the officials. The North Block will further build on the mall’s impressive portfolio of entertainment attractions that already houses a bowling alley, a nine-screen VOX cinema, Magic Planet and Bounce Abu Dhabi, the Middle East’s largest indoor trampoline park, he states. “There is no dispute that Marina Mall’s location is unparalleled in Abu Dhabi as it is one of the iconic sites of the capital and this has been one of the key reasons for our continued success,” remarks Chehabeddine. “These new plans will allow us to rejuvenate and heighten the experience we offer our customers for many years to come,” observes Chehabeddine. He says that in addition to the expansion plans, existing features within the current mall will also be upgraded, including the introduction of LED screens, renovation of current store front fixtures to open up the space, as well as enhancing the luxury area and the main entrance.